Rare Rolex Submariner dial 1680 - professional reprint on a Singer basis. It's okay just for the Rolex caliber 1575. The feet are positioned at minutes 30 and 57. The object is part of my personal collection. Rolex Submariner Quickset for 2-Tone and Yellow Gold Model. Condition Custom made dial. 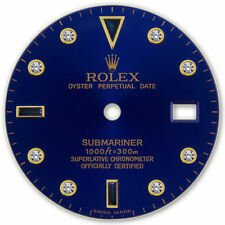 Customized Submariner Blue Color Dial with Bright Luminous Markers. Rolex Model Numbers: 16613,16618,16683,16808, 116613LN, 116613LB, 116610LN, 116610LV. Black Rolex Submariner 16610 Cal 3135 (will also fit 16800 Cal 3035). This is a genuine Tudor Prince Oysterdate Submariner dial, for reference 75090 etc. Dark blue colour. Tritium light material. 100% original Tudor dial! Rolex Submariner Quickset for 2-Tone and Yellow Gold Models. Condition Custom-made Submariner Blue Color Dial with Genuine 8 Round Natural Diamond Stones and 3 Natural Sapphire Stones. Rolex Model Numbers: 16613,16618,16683,16808, 116613LN, 116613LB, 116610LN, 116610LV. Rolex Submariner Quickset for 2-Tone and Yellow Gold Models. Condition Custom-made Submariner Black Color Dial with Genuine 8 Round Natural Diamond Stones and 3 Natural Sapphire Stones. Rolex Model Numbers: 16613,16618,16683,16808, 116613LN, 116613LB, 116610LN, 116610LV. Rolex Submariner Quickset for Stainless Steel Model. Condition Custom made dial. 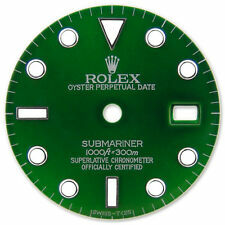 Customized Submariner Green Color Dial with Bright Luminous Markers. Rolex Model Numbers: 16613,16618,16683,16808, 116613LN, 116613LB, 116610LN, 116610LV. Rolex Model Numbers 16800, 16808, ect. Jewelerstools is not affiliated with Rolex USA and is not an Official Rolex Jeweler. This is a Factory Rolex Genuine Dial. This dial has not been repainted or refinished and is in new condition. Rolex Submariner 2 Tone & Yellow Gold Blue Serti String Dial. Rolex Submariner Quickset for 2 Tone & Yellow Gold Model. Condition Custom Refinished on Genuine Rolex Dial with Genuine Diamonds, Sapphire & Glossy Blue Colored Dial. SUBMARINER 200m/666ft. 11 1/2 line, 25,6 mm, 26 Jewels, Sweep Second. If you buy without basket DIAL ZIFFERBLATT. FREE Trial! Butin no circumstances we accept bargain for prize reduction. - screw down crown 0.9mm thread. Rolex Submariner Quickset for 2-Tone and Yellow Gold Model. Condition Custom Refinished on Genuine Rolex Dial with Genuine Diamonds, Sapphire & Glossy Black Colored Dial. Rolex Model Numbers: 16613,16618,16683,16808, 116613LN, 116613LB, 116610LN, 116610LV. Rolex Submariner 2 Tone & Yellow Gold Slate Grey Serti String Dial. Rolex Submariner Quickset for 2 Tone & Yellow Gold Model. Condition Custom Refinished on Genuine Rolex Dial with Genuine Diamonds, Sapphire & Glossy Slate Grey Colored Dial. Rolex Submariner Quickset for Stainless Steel Model. Custom Refinished on Genuine Rolex Dial with Genuine Diamonds Sapphire & Glossy White Mother Of Pearl. On the basis of our Natural Mother Of Pearl, every real dial's Color or Lamina of Mother Of Pearl may look slight different from Picture. ROLEX SUBMARINER 2 TONE GLOSSY SILVER COLOR SERTI STRING DIAMOND SAPPHIRE DIAL. Rolex Submariner Quickset for 2 Tone & Yellow Gold Model. Condition Custom Refinished on Genuine Rolex Dial with Genuine Diamonds, Sapphire & Glossy Silver Colored Dial. Type of Part Dials. Country/Region of Manufacture Switzerland. Black color. Rolex Submariner Quickset for Stainless Steel Model. Condition Custom made dial. Customized Submariner Green Color Dial with 8 Round Genuine Natural Diamond Stones and Bright Luminous Markers. Rolex Model Numbers: 16613,16618,16683,16808, 116613LN, 116613LB, 116610LN, 116610LV. Rolex Submariner Quickset for Stainless Steel Model. Condition Custom made dial. Customized Submariner Blue Color Dial with 8 Round Genuine Natural Diamond Stones and Bright Luminous Markers. Rolex Model Numbers: 16613,16618,16683,16808, 116613LN, 116613LB, 116610LN, 116610LV. Rolex Submariner Quickset for Stainless Steel Model. Condition Custom-made Submariner Slate Grey Color Dial with Genuine 8 Round Natural Diamond Stones and 3 Natural Sapphire Stones. Rolex Model Numbers: 16613,16618,16683,16808, 116613LN, 116613LB, 116610LN, 116610LV. Rolex Submariner Quickset for Stainless Steel Model. Condition Custom made dial. Customized Submariner Ceramic Solid Blue Color Dial with 8 Round Genuine Natural Diamond Stones and Bright Luminous Markers. Rolex Submariner Quickset for 2-Tone and Yellow Gold Models. Condition Custom-made Submariner Champagne Gold Color Dial with Genuine 8 Round Natural Diamond Stones and 3 Natural Sapphire Stones. Rolex Model Numbers: 16613,16618,16683,16808, 116613LN, 116613LB, 116610LN, 116610LV. Vintage dial with no defects. FOR VOSTOK AMPHIBIAN. Star and submarine. Very rare . Condition is Pre-owned. Shipped with USPS First Class Package. See back for fit. May mot fit new movements unless modified. Rolex Submariner Quickset for Stainless Steel Model. Condition Custom made dial. 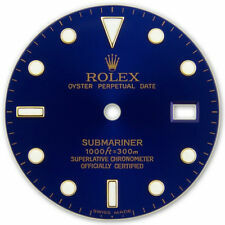 Customized Submariner Ceramic Solid Blue Color Dial with Bright Luminous Markers. Rolex Model Numbers: 16613,16618,16683,16808, 116613LN, 116613LB, 116610LN, 116610LV. Das Zifferblatt ist schwarz. Black dial, esfera negra. Das Zifferblatt wird als gebraucht verkauft. ONLY FOR NUR FÜR ROLEX SUBMARINER 16613 MODELLE ! 4 dials for DG2813. This dial will fit perfectly with any of my Submariner cases. Now its easy. WATCH DIAL CLASSICAL DEEP SEA SUBMARINER 32 mm Ø, APPLIED HR MARKERS, C SUPERLUMINOVA, MADE FOR ETA 2824-2 and SW 200, BLACK. fit ETA cal. 2824 SW 200. DIALS 2824, 2892. HANDS 2824, 2892. CASES 2824. Fit ETA cal. 2824 SW 200. DEEP SEA SUBMARINER DIAL. complete DEEP SEA SUBMARINER KIT. MATCH HANDS(THETA). PASSENDE ZEIGER(THETA). TACHY RING made for opening Ø 30.4 mm. Outer total Ø 32 mm. This dial will fit perfectly with any of my Submariner cases. Now its easy. Dial only. Fit Seiko 7S26 NH35. White markers. Fit ETA 2824 2836. Dial only. Dirty Yellow markers. Black Matt Finished.